Whew. We’ve had quite a month here at the FCN household. As many of you know, we bought a new car last month. What most of you don’t know is that we bought another new car this week. The first time around, we were replacing my wife’s old minivan and we opted to sell the old car ourselves. This time, we went another route. I once again started the process of negotiating at arm’s length using the internet as my ally. I checked both Edmunds and TrueCar to get a feel for what people are actually paying for the vehicle we were looking at. I then got a baseline price from Costco, and used that as a comparison point when shopping around for the best deal. In doing this, I didn’t bring up the possibility of a trade-in because I didn’t want to muddy the waters. At the same time, I checked the value of my old car using both Edmunds and Kelley Blue Book, and I noted both the private party sales prices and the estimated trade-in value. Based on our recent experience selling a car in our local market as well as the make, model, mileage, and condition of the car, I figured the best I could hope to get in a private party sale was $9500, possibly a bit less. So… With an agreed upon price for the new car and a solid knowledge of the value of our old car, we headed to the dealer. Upon arrival, we inspected the new vehicle and asked to take it for a drive. At the same time, I asked them to take a look at the old car and let us know what they’d be willing to pay if we traded it in. I knew that they’d offer less than what I could get if I sold it myself, but there are other factors (both financial and non-financial) to consider here. First and foremost, in most states with a sales tax, the price of your trade-in is subtracted from the purchase price of the new vehicle before they calculate the sales tax. Around here, that amounts to a 7% savings. Next up, we have the cost of selling it. In order to get top dollar, I’d have to get the car detailed. To get it near showroom quality (inside and out as well as in the engine compartment) we’d have to pay around $125. On top of that, I’d have to take out an ad in the newspaper ($50/week — I also use Craigslist [free] but for whatever reason have better luck with newspaper ads). Finally, I typically buy the CarFax ($35) and provide that to potential buyers when showing the car. In addition, we have the value of my time. This is harder to put a number on, but if I sell the car myself I have to make time to get it detailed, show it to people, etc. This often has to be done at their convenience, which could mean taking time off work, missing soccer practice (we’re in season and I’m coaching), etc. Finally, we have the various headaches and risks associated with selling to a private party. How do you deal with the inevitable test drive? The request to take it to a mechanic? What about closing out the deal without getting ripped off (e.g., getting bad check or having to do a high value cash transaction with a stranger). There are workarounds for all of these, but they require time and effort. In the end, I decided that I’d be happy with somewhere in the neighborhood of $8500 on the trade-in. That $8500 would be worth $9095 after factoring in the sales tax savings. I would also save around $210 in costs related to the sale (assuming a quick sale), bringing the effective value up to $9305 — pretty close to what I could get on my own, and without any headaches. When we got back from the test drive, I inquired about the appraisal on our old car. They came back with an offer of $7600, which was way too low. After a few rounds of back and forth, I got them up to $8400, which was close enough to my target that I pulled the trigger. Negotiations at the point had slowed to a crawl, so I don’t think I could’ve done much better. Assuming that I was right about being able to sell the old car for $9500, I ended up leaving around $300 on the table. As far as I’m concerned, that $300 was money well spent given the time commitment and headaches I avoided by doing a trade-in vs. selling it myself. Negotiate the price of the car ahead of time — and independent of any possible trade-in. Be sure you’re happy with the sale price regardless of what you do with your old car before setting foot in the dealership. Likewise, do your homework and know what your old car is worth heading to the dealer and soliciting an appraisal. Clean up your old car before heading to the dealer — you don’t need to invest a ton getting it detailed, but vacuum it out, remove all the extra junk, etc. Don’t be afraid to walk away from the trade-in (or the purchase as a whole) if the dealer’s final offer isn’t to your satisfaction. Be prepared to close the sale right then if you reach a satisfactory deal. In our case, I got them to bump up the last couple hundred dollars to $8400 by saying that I’d write the check “right now” if they could do this. At that point, I was also able to produce the title to the old car (I had it in my pocket the whole time) as evidence that I was ready to close the deal. Note that I had intimated earlier in our discussions that, if we couldn’t reach an agreeable price on the trade, I’d need to go home and think about the entire transaction. In reality, the price on the new car was good enough that I would’ve ultimately gone through with the purchase either way, but I would’ve hung onto the old car and sold it myself if they hadn’t made an acceptable offer. In the end, I probably could’ve come out a few hundred dollars ahead by selling the old car myself, but I’m quite happy with the price vs. convenience tradeoff in this case. Oh, and in case you’re curious, I chose to go the private party route in our previous transaction because the situation was different. That car was a bit older, had much higher mileage (albeit with a relatively recently rebuilt transmission), etc. and the trade vs. sell numbers worked out in favor of the latter. I also live in Missouri. I recently bought a new car and I sold my old pickup private party on Craigslist. Missouri titles have a “Notice of sale” portion of the title that is filled out and torn off when you transfer a title. The sales price is on this section and I just took this in to the DMV when I titled the new car. They calculated the sales tax based on the purchase price of the new car less the sales p[rice of the pickup. I think you can submit the notice of sale and get a voucher for the sales tax discount as well but I’ve never done this. There is a 6 month limit on the separation of the transactions. I live in Missouri and know to be the case in this state. I have work with the Missouri Dept of Revenue and was under the impression this was similar in most states, I may be wrong about that. I have done this in Missouri though. Wow, this is a great breakdown of the process. It seems like doing your hw about the blue book value of your trade in definitely helps when negotiating a price. Alternatively, I think you can list it on craigslist and see what kind of interest you get at a certain price and use that as a comparison point to the value you’re offered through the dealer. Out of curiosity, what drove your decision to trade a car that’s worth so much? My mom laments my hideous 12 year old car, but at 90k miles, I can’t justify replacing it, especially when factoring in fuel economy, increased insurance costs etc. 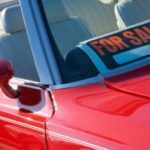 I’m an advocate of selling used cars through private transactions, but I can see how convenience is a factor when the price offered as a trade-in is satisfactory. Nice negotiations on your trade-in and new car. I’ve found that trade-ins work best with low mileage, recent models (up to five years old) and cars over 100K are best sold by owner. The middle range causes problems, but have recently found that there is a for sale by owner market for mid range cars that appeal to parents buying for teens such as a Mazda 3. “In most states you don’t have to trade your car in to get the credit off the sales price. You just have to have documenation of the sales price of the vehicle.” Corey this is interesting as I thought that the whole idea of trade-ins and the sales tax was done to help car dealers. I will look into this. If you have a CarMax store in your area, it’s in your best interest to get an appraisal from them as well. I’ve sold two cars to CarMax, including one that barely made it in and still got a few grand, cash money, that day. It can at least set a floor for you and give you a week to see if you can get a better offer. Thanks for this post. We will have to buy a replacement car in the next few yearss, and I dread having to sell our old one. I want to share another option for getting a valuation for an old car and trading it in. 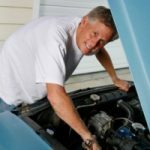 AutoTrader.com has a free program for consumers called Trade In Marketplace (TIM). This is how it works. * A consumer interested in trading in his or her vehicle accesses http://tradein.autotrader.com. * The seller inputs information about the vehicle, including the make and model, the model year, major factory-installed options, other upgrades and maintenance information and details about the condition, including any major repairs or accident damage. * TIM calculates a price based on historical transaction data and up-to-the-minute supply and demand information and produces a printable purchase offer and a list of participating dealerships. * The seller takes the purchase offer to a participating dealer in the area. * The dealer inspects the car to confirm the car’s condition and then the seller can use the funds toward the purchase of their next vehicle or walk away with a check. I do work for AutoTrader.com, and I have personally worked with the Trade in Marketplace data. You may want to discount this information as a shameless plug, however, it is another option for getting a free third-party valuation for the car you want to trade in or dispose of. The offer can also be used as additional information by those of you who may want to negotiate their trade-in. The program is a couple of years old, and we have already made over 3 million offers so far. Corey: I can’t comment on how it works in other states, but I’ve never heard of that, and it’s definitely not how it works around here. In fact, based on what I’ve been able to dig up, there are 10-12 states in which the value of the trade-in isn’t exempted from sales tax. If you can provide some more information (e.g., a link to an authoritative explanation) I’d love to see it. 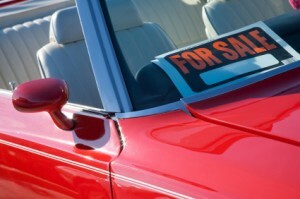 In most states you don’t have to trade your car in to get the credit off the sales price. You just have to have documenation of the sales price of the vehicle.